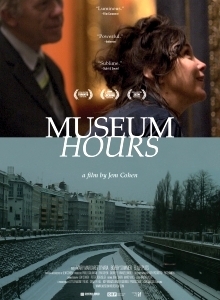 Jem Cohen paints an arresting and mesmeric drama in his first narrative feature, Museum Hours (2012). Comparable to the literature of Italo Calvino in the way Cohen has managed to produce a potent portrait of both the physical and the emotional, it effortlessly glides through art history, wrapped in the warm drama of a chance encounter. Unashamedly intellectual, Cohen has crafted a masterful piece of graceful cinema set amidst the halls of Vienna’s Kunsthistorisches Museum. We follow Johann (Bobby Sommer) as he whiles away his days looking after the portraits and landscapes that adorn the walls. Circumstances lead Johann to cross paths with Janet (Mary Margaret O’Hara), who has travelled from America after discovering that her cousin has been taken seriously ill and now lies in a coma in hospital. After Johann provides Janet with directions to the hospital, the two become friends and begin to explore both the museum and the city together. Devoid of the trappings of a romance piece, the friendship that the two strike up is poetically, as well as platonically, told, demonstrating a level of introspection that encourages the audience to accompany them on this physically small, yet intellectually expansive, journey. One of the many lenses through which we see the city is the work of Brueghel, who finds riches in the smallest of acts. In one moment, we are treated to a lecture, provided by a tour-guide in the museum, as to the aesthetic raison d’etre of the Flemish master. Such a detour might sound clumsy, yet this moment allows us to see through the characters’ eyes proving that they are as much us as we are them, whilst merrily informing us of a great deal of art history. There is a charmingly warm yet melancholic tone to the piece, which wanders like a tourist through the city; yet at the same time examines not the obvious but the minute. Stepping away from the museum we enter the underground lakes of the city, the taverns and the street corners. Such moments emphasise the seemingly inconsequential moments of life that make up each and every day. Whilst in general this film is incredibly refined, there are moments where Cohen oversteps the mark, such as a brief surrealist scene involving nudes that detracts from the overall tone of the movie, stumbling for a moment before once again finding its feet. Taken as a whole, with Museum Hours Cohen has balanced both the head and heart, producing a serene quality that feels like a lazy Sunday afternoon strolling off the streets into an art gallery, absorbing what is on offer, whilst deep down knowing we are merely glimpsing a deeper truth.